The first book I decided to read in 2016 was Emma Donoghue's Room. As often as I can, I try to read a book before watching the movie. Since the film came out this past fall, I wanted to read Donoghue's version before catching it on screen. Five-year old Jack lives with his Ma in Room. To Jack, Room is all there is in the world--Room IS the world. When Jack's Ma was nineteen, she was kidnapped and locked in a shed (Room) by her captor, Old Nick. For the last seven years, Old Nick has kept her there and regularly raped her. During this time, she gave birth to Jack. Ma chooses to teach Jack that there is nothing else outside of Room and that everything that they see on tv isn't real. One day, Ma finally tells Jack that she has lied to him and that there actually is more to the world outside of Room, and she helps him to escape and also rescue her from capture. Through the rest of the story, Jack and Ma must adjust to the outside world and move on from Room, which is not an easy task for either of them. This book, guys. It's so dark. The life that Ma and Jack live in Room is one that we would not wish upon our worst enemies. However, Room is written from Jack's point of view, so the tone of the book is more positive than one would anticipate. Jack loves his Ma, and he loves his life in Room. When he is exposed to the real world, it's a tough transition for him, but he takes it in stride. Jack is so naive and has so much to learn, but the way that Donoghue writes Jack's thought process is fascinating and often humorous. For example, Jack sees a bee for the first time and gets stung in an attempt to pet it; he describes it as the most outrageous pain he's ever felt and bemoans the incapacitation of his arm. At those times, I was able to clearly see Jack as a five-year old child. For the most part, though, Jack is so mature and intelligent, and it would shock me when he would then behave as a child would. It would anger me that he would at times not take Ma's feelings into consideration when making choices or would throw a tantrum, but those are things that five-year olds do. Room does not take place at all from Ma's point of view. If it did, the book would have a totally different tone. Ma has known fear, pain, and sorrow in Room, and to leave Room is one of life's greatest reliefs for her, whereas it is life's first real known challenge for her son. Had Room been written from Ma's point of view, I'm sure that I would not feel as hopeful while reading it, especially in the portion of the book where Ma and Jack are in Room. It was a smart move on Donoghue's part to write from Jack's point of view. An innocent child sees things very differently than a scared twenty-seven year old does, and I don't know that I could have made it through the book without Jack's upbeat perspective. Now, to contradict myself. Although I enjoy that Jack is the narrator, I wish that there had been more focus on Ma throughout Room. Yes, Jack loves her more than anything else and wants to always be with her, but the idea of Ma is more prominent in Room than is Ma's actual presence. 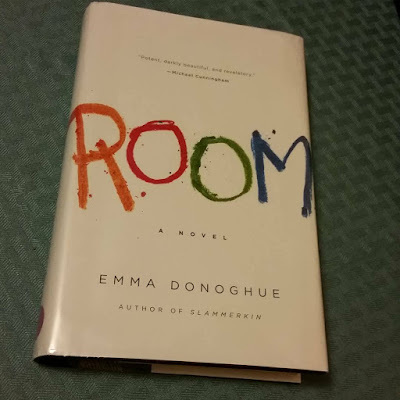 I wish there was more interaction between Jack and Ma, but otherwise I thought Room was a great book and a solid selection for the first read of 2016. Now I can go see the film! I don't know if I can do this one. It sounds really good but sometimes the heaviness gets to me. Especially with all the darkness that's already in the world. Great review though!! Thanks, Angie! The narration coming from 5-year old Jack helps to take away the heaviness, although it's of course still there. His perspective certainly helped make it easier to read in that way.